Regular dental cleanings are the key to long-term oral health and overall wellness. 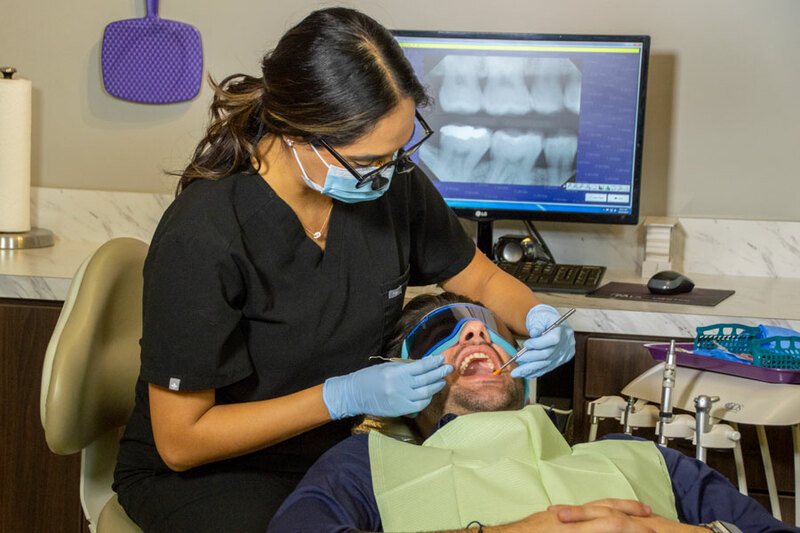 At Printers Row Dental Studio, we are dedicated to providing unparalleled care, and offering the best teeth cleaning Chicago has to offer is a part of our commitment to you. The value of a professional teeth cleaning cannot be underestimated. While daily brushing and flossing is essential in maintaining your overall oral health, it is simply not enough. When you brush and floss regularly, you are removing plaque from your teeth. However, in those hard-to-reach areas, that plaque builds up and forms tartar. If this tartar is not removed by our team here at Printers Row Dental Studio, it can lead to tooth decay. Teeth cleanings are important because they prevent a slew of oral health problems, including gum disease, cavities, and more serious infections or abscesses. Prevention is the best form of treatment, and we take care to ensure that you get a high-quality teeth cleaning every time you schedule your bi-annual cleaning. We customize the type of cleaning that you need based on what we discover during your exam. Cleanings are recommended at least twice a year, but we may recommend a different frequency depending on your individual needs. Routine teeth cleaning: A basic preventative cleaning is for someone without gum disease and should take place twice a year. To treat periodontal disease (gum disease), we suggest what is often known as a deep cleaning. This is a clinical treatment for treating gum disease and stopping the progression of it. Your professional cleaning will take roughly one hour. Your dental hygienist will gently remove plaque and tartar build up using specialized instruments. We will ensure to keep you comfortable during the procedure. We offer a wide range of amenities to keep you comfortable throughout your cleaning: anesthetic, noise-canceling headphones, blankets, Netflix, and more. Post-cleaning education will include how to properly reach problematic areas, effective brushing, and instruction on caring for your teeth. Dr. Ema will speak with you about any issues or questions that you may have. If you’re ready to schedule your next professional dental cleaning, call Dr. Ema today at (312) 435-0411 or request an appointment online.